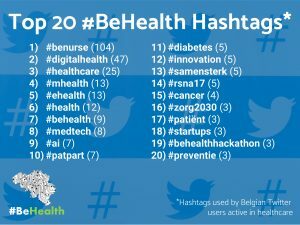 Every month we analyze the Twitter usage of Belgian Twitter users active in healthcare. This gives us a view of the topics most users tweet about. We are currently following more than 1300 professionals active in healthcare and in November 880 of them were active on Twitter. Together they tweeted 27740 times with 60% of them using hashtags. Wondering what the score means? That’s the number of twitter users we follow that use the hashtag multiplied by the number of tweets. The result is than divided by 100 to get the score you see listed. For example, for the #benurse hashtag there were 417 tweets by 25 twitter users leading to (417 x 25) % 100 = 104.